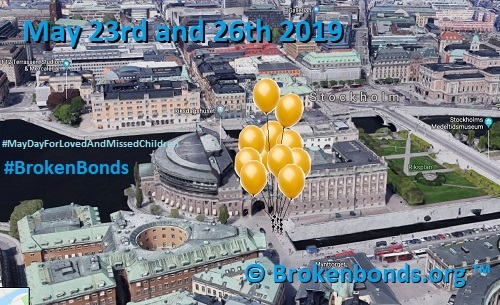 50 Broken Bonds / missed children as yet, implying approx 765 lost close relationships. Mean distance 450 km / 279 miles. 32 affected have contributed. GREAT THANKS - please spread the word! * NOTE ! More on times here. A silent, peaceful but visually forceful manifestation at the Parliament in Stockholm. Every child will be seen - represented by a golden balloon ! 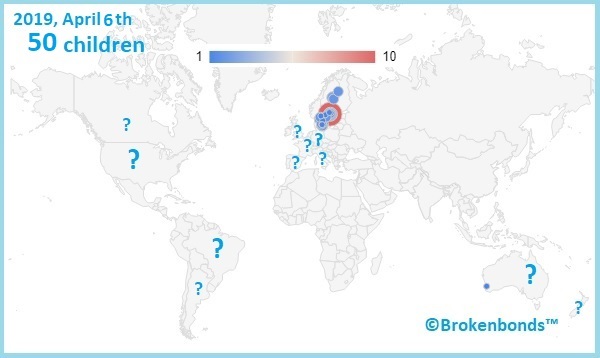 News: 10th day in action, 50th child on the map - 1st outside Sweden - Perth, Australia. Lets make this global and visual! Next: Planning AW. 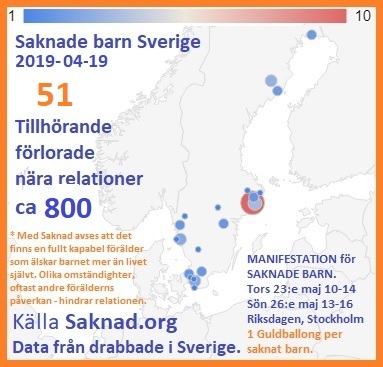 Wedn Apr 24th 5pm Pitcher's Stockholm. Get on the map ! "I think that mother is saying things to Isabel..." Lovisa 7 years old. "They never give up - and finally the system provides them with what they want..."